Even though 2018-19 NHL cards are available, 2017-18 Upper Deck The Cup Hockey is a perfect example of saving the best for last. Each tin includes two autographed patch cards with at least one being for a rookie subject. A high-end favorite for many years, the final release of the season features some of the most popular rookie cards out there, plus more Exquisite Collection cards. This is similar to the 2016-17 set. 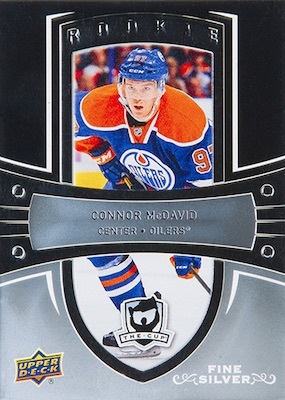 The premium base set in 2017-18 Upper Deck The Cup has 249 copies, with Gold Spectrum (#/36 or less), Black Foil (1/1), and Masterpiece Press Plates (1/1) parallels. Additional parallels add a signature and/or relic piece, including Gold Spectrum Foil Auto (#/12), Gold Foil Auto Patch (#/8), Gold Foil Patch (#/8), Red Foil Auto (#/4), Red Foil Tag (#/4), Green Foil Auto Button (#/3), Green Foil Button (#/3), Black Foil Auto (1/1), and Black Foil NHL Shield (1/1). One of the key parts of the entire 2017-18 Upper Deck The Cup Hockey checklist is the Autographed Rookie Patch subset. Level 1 subjects have 249 copies while Level 2 drops to just 99 cards. Parallels include Gold Foil Auto Patch (#/24 or #/12) and Red Foil Auto Tag (#/8 or #/4). There are also Rookie Auto (#/249) and Rookie Patch (#/249 or #/99) cards for the key first-year players. These have parallels, as well, including Gold Spectrum Foil Auto (#/36 or #/24), Gold Spectrum Foil Patch (#/24 or #/12), Red Foil Tag (#/8 or #/4), Green Foil Auto Button (#/3), Green Foil Button (#/3), Black Foil Auto (1/1), and Black Foil NHL Shield (1/1). Joining the RPA cards, many other inserts make up the possible selection of autographed patches that fall two per box. Limited to just 10 copies each, the new Rookie Tribute auto patch honors 2005-06, 2006-07, 2007-08, 2008-09 and 2009-10 designs. More 2017-18 Upper Deck The Cup Hockey hits come in the Cup Foundations (#/15) and Rookie Foundations (#/15) lines with a few one-of-one Tag versions. Many collectors are likely very familiar with the returning Emblems of Endorsements (#/15), Honorable Numbers (jersey #'d), Dual Honorable Numbers (jersey #'d), Limited Logos (#/50 or less), Scripted Swatches, Dual Scripted Swatches (#/15), Signature Materials (#/99 or #/25), and Dual Signature Materials (#/35 or #/15). High-end booklets include Auto Pro Gear Booklet Jersey-Patch (#/12), Auto Rookie Gear Booklet Jersey-Patch (#/24), Autographed Monumental Patch Booklet (#/6 or #1/1), and Dual Auto Rookie Bookmarks (#/18). 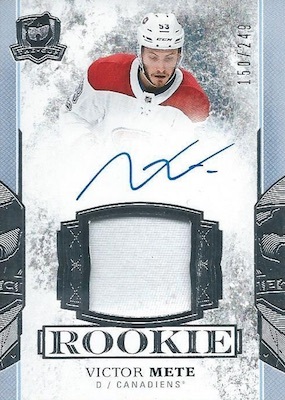 Also the place to find some of the best Exquisite Collection offerings of the year, 2017-18 Upper Deck The Cup Hockey supplies Exquisite Endorsements Relics (#/50 or less) and jersey-numbered Exquisite Rookie Auto Patch cards. Packed with hits, 2017-18 Upper Deck The Cup Hockey adds even more quality choices, like the new Razors Edge #/10 with pieces of game-used skate blades. Continuing themed sets from previous releases, there's Brilliance (1:10), Enshrinements (#/99 or #/25), Enshrinements Duos (#/25 or #/10), NHL Glory Autos (#/10), Program of Excellence Auto (#/10), Program of Excellence Dual Auto (#/5), Scripted Sticks (#/35), Dual Scripted Sticks (#/15), Signature Renditions (1:6), and Signature Renditions Combos (1:100). Simple and elegant, The Show is a quality autograph set for rookies (1:80) and veterans/legends (1:120). Numbered to the draft spot where they were taken, Top 10 Picks Autos looks at notable rookie names. Various 2017-18 Upper Deck The Cup Hockey booklets give fans more space to enjoy via 9-way Signature Booklet (#/9), Monumental Patch Booklet (1/1), Monumental Rookie Patch Booklets, Legends of Hockey Triple Signed Booklet (#/9), and Ticket Inscription Booklet. 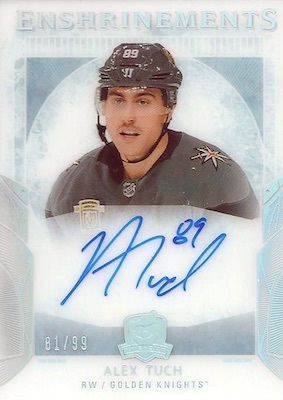 As for the memorabilia, the Cup Foundations (#/25) and Rookie Foundations (#/49) jersey cards have low-numbered Patch, Premium and Tag parallels. Multi-player relics options consist of Cup Trios (#/25), Cup Quads (#/10), and Cup Sixes (#/5), adding Premium Materials Gold (#/10 or less), Premium Materials Red (#/2), Button Green (1/1) editions. There are also unsigned Limited Logos (#/25) cards for rookie players, while the Championship Etchings (#/15) set showcases sterling silver nameplates for all-time greats. The Color Coded (#/33) and Color Coded Rookies (#/44) cards are other new options. And we can't forget the rare Notable Nameplates and Property of (1/1). JOHN HAYDEN 2017-18 Upper Deck THE CUP ROOKIE Patch 249! Chicago Blackhawks. 17-18 THE CUP 06-07 RETRO ROOKIE SSP AUTO PATCH 3CLR CONNOR MCDAVID S#08 10 WOW! 2017-18 The Cup Limited Logos Autographs Mikael Granlund Auto Patch 50 17 18 !! 2017-18 The CUP Zach Werenski Gold Auto 12 Plus Brilliance Auto!! Shop available 2017-18 UD The Cup NHL cards on eBay. 90 cards. Serial numbered #/249. PARALLEL CARDS: Masterpiece Plates 1/1. Most cards are auto patch (AP) but some are just autograph (Au), just patch (P), or base (*). PARALLEL CARDS: Gold Spectrum #/4, Plates 1/1. Most cards are auto tag (AT) but some are just autograph (Au), just tag (T), or base (*). 131 cards. Serial numbered #/3. 142 cards. Serial numbered 1/1. 135 cards. Serial numbered 1/1. 10 cards. Serial numbered #/10. 8 cards. Serial numbered #/10. 6 cards. Serial numbered #/10. 4 cards. Serial numbered #/9. 8 cards. Serial numbered #/12. Specific group odds noted below. 39 cards. Serial numbered #/15. 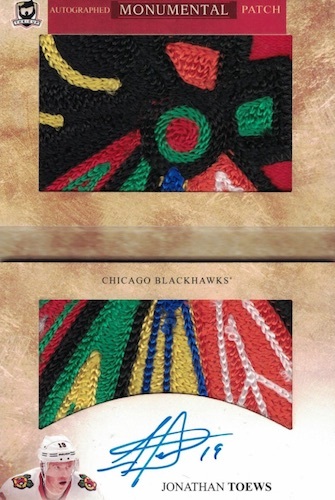 PARALLEL CARDS: Patch #/5, Patch/Tag 1/1, Jersey/Tag 1/1 (No Dubnyk*). 7 cards. Serial numbered #/18. 22 cards. Serial numbered #/15. 2 cards. Serial numbered #/9. 19 cards. Serial numbered #/10. 7 cards. Serial numbered #/10. 2 cards. Serial numbered #/10. 11 cards. Serial numbered #/35. 2 cards. Serial numbered #/15. 7 cards. Serial numbered #/15. 21 cards. Serial numbered #/15. PARALLEL CARDS: Patch #/10 or #/5. 2 cards. Serial numbered 1/1. 46 cards. Serial numbered #/25. PARALLEL CARDS: Gold Patch #/10, Red Tag #/2, Green Button 1/1. 34 cards. Serial numbered #/10. PARALLEL CARDS: Gold Patch #/5, Red Tag #/2, Green Button 1/1. 15 cards. Serial numbered #/5. PARALLEL CARDS: Gold Patch #/3, Red Tag #/2, Green Button 1/1. 17 cards. Serial numbered 1/1. 9 cards. Serial numbered #/10. All cards limited to four total copies. See the spreadsheet at the bottom for specific info. PARALLEL CARDS: Shield 1/1 (No Nylander*). View the full 2017-18 Upper Deck The Cup Hockey checklist spreadsheet. I dunno, am I missing something here or does it seem really lame. Some nice additions but until I see the entire checklist, the jury is out. Here’s the thing with “The Cup” it looks again like a very good product, but the price vs. value is just not good. Most likely you won’t get any good return from your tin as the Rookie Class isn’t that great, so if you don’t have a deep wallet you better stay far away from this! Nevertheless as mentioned there are some beautiful cards in this product and for single collectors this is an exciting time as you can scoop them up for reasonable prices on the secondary market. Terrible checklist, especially for the Pens. You’d think they’d try to compensate for such a horrendous rookie class. I was thinking about getting the Penguins on a break, but UDs infatuation with Connor Sheary is comical. Hopefully sp authentic will bring some value. 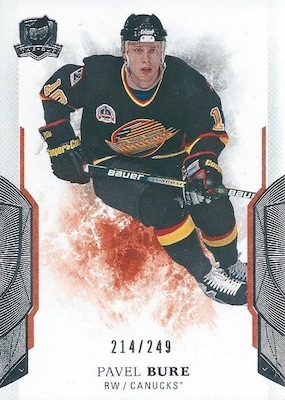 The Canucks have 200 different cards in this set. 104 of those are printing plates and 32 of those 104 plates are Brock Boeser autographed. 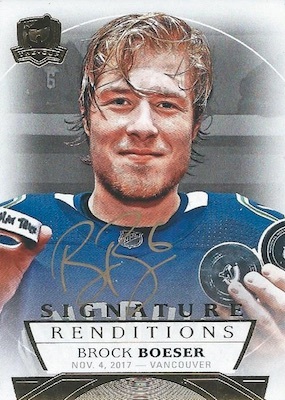 Rough estimate, Boeser has about 800 cards. Looking at some of the breakers, Canucks are going for $475-$500. Good luck to those who dare! Buy, Buy, Buy! Bure only has non-autographed printing plates and the only other Canucks to have an autograph is Horvat and Luongo (1 card). 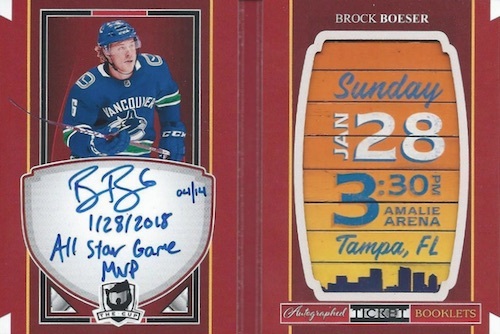 Price Point per pack $600..
and for that money its IMPOSSIBLE to may anything close to that no matter who you pull..
Boeser is baggin it this year and his patch rook should go for no more than $500 – not even pack price..
best advice – dont buy this when it comes out as there will be plenty available later at a much lower price…. UD doesnt care how much they steal from buyers..
Wow! 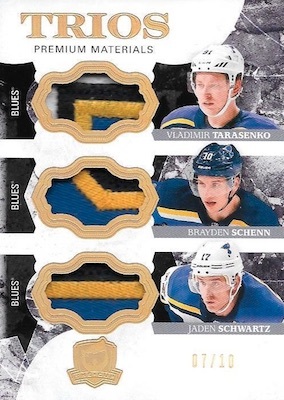 Busted an inner case and hit the very card of the St. Louis Blues triple patch you have in the write up. That is cool! From this case the rookies were nobody special but I did hit two 1/1 auto printing plates and an awesome 1/1 Shield. For only three tins, I was lucky. Watched 5 cases being opened and 3 printing plates cards had the wrong player on the card !! Come on UD quality control is seriously lacking !! Never had the stomach to open such an expensive product as this industry feels like gambling with athletes on your scratch tickets. I must have got a super case as every box had two rookie auto patches and I pulled a McDavid silver rookie which I can’t even figure out what to call before I put on ebay. Upper Deck owns hockey and I love hockey. I cannot spend $1 on panini for a baseball product that makes them hide the logo what a joke. 2016-17 Upper Deck The Cup Hockey Hobby 6-Box Factory Sealed Case Matthews?